**A light lunch will be served at 12:30 p.m. Talk begins promptly at 1:00 p.m.
After decades of occupation and creeping annexation, Israel has created an apartheid system in historic Palestine. Peace efforts have failed because of one hard truth: the best Israeli offers do not meet the minimum that a truly free Palestine would require—nor that international law would recognize. There are, however, widening cracks in Israel’s traditional pillars of support for this policy, and in this book Ben White lays them out. Opposition to Israeli policies, he shows, are growing within Jewish communities and among Western progressives, while the rise of populist movements around the world has confused traditional party lines on the question and the Palestinian-led boycott campaign continues to gain momentum. Now, White argues, is the time to plot a course to avoid the mistakes of the past—to create a real way forward, and beyond apartheid, in Palestine. 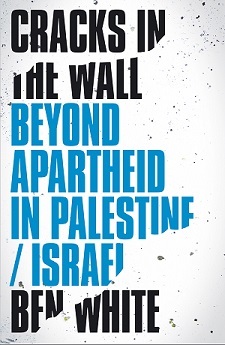 Copies of Cracks in the Wall – Beyond Apartheid in Palestine/Israel will be available to purchase. Ben White is a journalist and analyst, who has been visiting and writing about Palestine for more than a decade. He is the author of four books, including Israeli Apartheid: A Beginner’s Guide, and his latest, Cracks in the Wall: Beyond Apartheid in Palestine/Israel. His articles have been published by the Guardian, Independent, Al Jazeera, Newsweek Middle East, and many others. He is a contributor for Al-Shabaka: The Palestinian Policy Network.